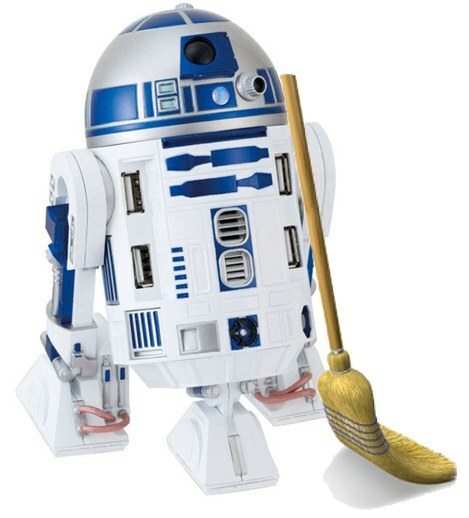 Artoo (probably from the R2-D2) is a useful tool for all of us who work with external GIS data connected (or imported) to AutoCAD Map 3D. Project Artoo is an add-on tool for Map 2013 and it is available as a "technology preview" from Autodesk Labs. For the data connected via FDO, Artoo offers the same cleanup functionality as Map offers today for GIS data in the DWG format. Cleaning data is an important step before you can apply any topological features on the source data. With Artoo you can break crossing objects, delete duplicates, extend undershoots, snap clustered nodes, erase zero-length and short objects, erase dangling objects, dissolve pseudo-nodes, simplify objects, weed polylines, remove sliver polygons, re-form polygons and correct duplicate points. All of this can be done on any data source connected via FDO, e.g. SDF, SQLite, ESRI SHP, Geodatabase, or spatial databases Microsoft SQL Server and Oracle Spatial. The CAD tips and tricks repository at CADforum.cz offers already 2.266 tips for AutoCAD, Inventor, Revit and other Autodesk products (plus about 6.000 CAD tips in Czech). CAD Forum offers also other CAD resources avalilable to already more than 281.000 registered users - CAD models and symbols, videos, freeware utilities. 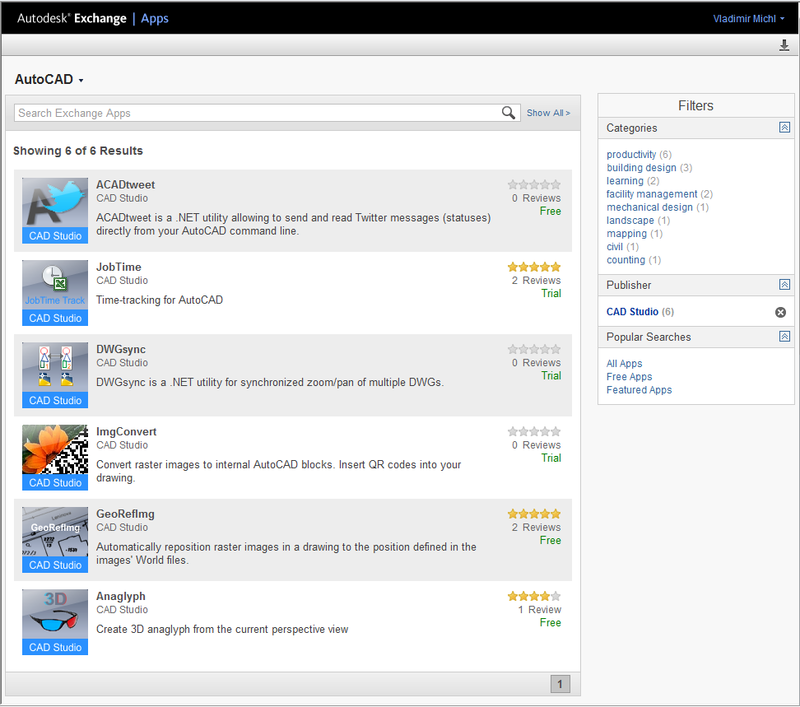 List of CADstudio add-on tools on Autodesk Exchange Apps "appstore"
Subscribe to CADforum RSS feed to get the latest CAD tips or follow us on Facebook or Twitter. CAD Studio as a member of Autodesk Developer Network (ADN) has developed hundreds of plug-ins for AutoCAD, Inventor, Revit, Civil 3D, Vault and other Autodesk products. Some of these plug-ins are now available also on the Autodesk "appstore" - Autodesk Exchange Apps. As the most part of our tools is free, you may want to check their functionality by installing them from Exchange Apps. Installing a tool from Exchange Apps is very simple. Start the Exchange Apps - either directly from your CAD or in your web browser - locate the requested tool and click on the Free or Trial button. All installation and integration into your CAD products' ribbon is done automatically. 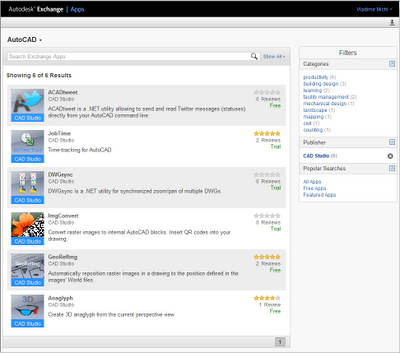 Exchange Apps is integrated into AutoCAD 2013, Inventor 2013, Revit 2013, Vault and other products. Here you can find e.g. the JobTime to keep track of your job time spent in AutoCAD or Revit, Anaglyph to make stereographic 3D pictures (for red-cyan glasses) of your models in AutoCAD, Inventor or Revit, DWGsync to zoom/pan two drawings synchronized, GeoRefImg to place your images automatically. More CAD tools can be downloaded from www.cadstudio.cz/download. 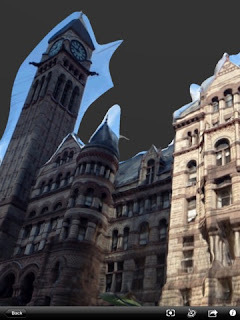 The application Autodesk 123D Catch (formerly "Photofly"), which uses web-cloud technologies to convert a series of photos to a realistic 3D model, now works also on Apple iPad and in web browsers (Google Chrome). So you can control the whole conversion process on your mobile device - from capturing photos, over the conversion the resulting point cloud to a 3D model and its texturing (123 Catch), up to interactive viewing and sharing of 3D models. The new application 123D Catch for iOS is available for free (similar to the other tools of the family Autodesk 123D) and you can download it to your iPad from Apple iTunes. The version for a web browser can be run from the address apps.123dapp.com/catch/. In your web browser, you can find a new web cloud storage "My Corner" where you can store your 3D models and other data from the 123D applications.